A new entry in my long-neglected series “Ha Ha — This’s Person’s Name,” thanks to this screengrab of the most recent episode of NCIS: Los Angeles. A real-life dude, too — at least according to IMDb — and quite a bit more accomplished than you’d expect from someone named Speed Weed. I mean, hell — I should be so lucky. 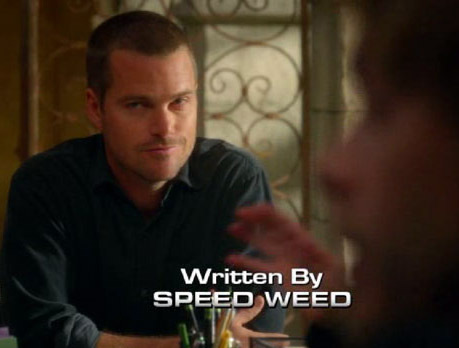 Look at what he’s done with Speed Weed compared to what I’ve done with my boring name for losers. Make Way for the Moondancers! “Moving in the Direction of the Bushy Hairstyle”? Trick Question: Nothing Rhymes With Lust! Analyze EKG / Can You See a Memory? The Best Pranks of April Fools’ Day 2010!! !